Amazon Organics is a new range of natural hair care products with ingredients sourced from the heart of the Amazon rainforests. Rich in antioxidants this 100% natural range will help restore volume and vitality to hair while protecting against the day-to-day effects of our ever changing environment. Amazon Organics was created for people who believe in using only the purest natural products in their daily beauty regimes, as well as for the environment. The products are perfect for those who share a growing concern about climate disruption, global warming and the future viability of the Amazon rainforest. "After visiting the Amazon rainforest myself and witnessing first-hand the incredible beauty, I was inspired to create a line of products using the rainforests natural offerings that also support its continued growth," Amazon CEO Panch Prasad said. Each of the products contains ingredients unique to the Amazon rainforest. 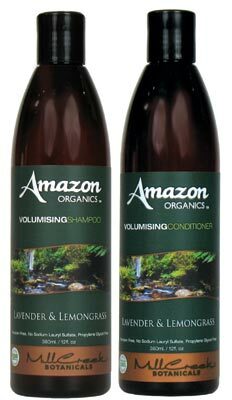 Amazon Organics Volumizing Shampoo with Lemongrass, Rosemary and Mint uses the purest natural botanical ingredients from the Amazon rainforests. Enriched with Maca, a mineral-rich root found to stimulate and balance the body and mind. Amazon Organics Volumizing Conditioner with Kava leaf a proven relaxant, washing away the stresses of our busy lives. Using only the botanicals and extracts of the Amazon rainforest, Amazon Organics supports the sustainability and future viability of this valuable natural resource. The ingredients are sourced by locals and collected by hand to alleviate the risk of harming the natural resources present in the Jungle. All of the botanicals are sourced from the forest floor to help avoid depleting the forest of its natural resources. Amazon Organics are free of Paraben, Sodium Lau-reth Sulfate (SLES), Sodium Lauryl Sulfate (SLS), and Propylene Glycol (PGP), and are made with only the purest natural ingredients to achieve optimum health and wellness. Available in all good health food stores and pharmacies.